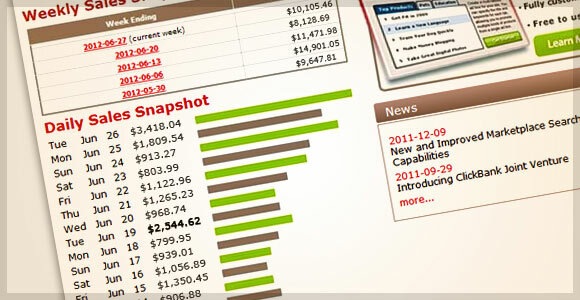 One of the first companies many affiliate marketers become acquainted with is Clickbank. Clickbank has been around almost since the worldwide web started. They offer over 46,000 information products for sale through over 1.5 million affiliate marketers. However, as with any popular marketplace, scam artists have signed on and created problems for well meaning and honest affiliates and product producers. Don’t give up on Clickbank yet, though. It is still possible to make a great living as a Clickbank affiliate. Here are a few tips to help you protect yourself from the scammers while making a regular income using Clickbank. Choose the right products and investigate the merchants whose products you plan to help sell. Clickbank attempts to make sure that all the merchants selling products in their marketplace are reputable, but remember that scam artists are very creative and very smart. One of the great advantages of using Clickbank as your source for affiliate products is that Clickbank, rather than the merchant, takes care of paying you. All the money runs through Clickbank so you get paid whether the merchant wants to or not. The real problem you need to worry about is the quality of the products you are selling. If you put a lot of effort into promoting terrible products that don’t deliver on their promises, your own reputation is affected and this will hurt your future income. The solution is simple. First, once you have decided on a product you hope to promote, do a simple Google search with the author’s name followed by “scam” or “ripoff”. One thing about the internet, bad news travels fast. You can quickly determine if the producer of the product you intend to promote has a bad reputation. However, be careful not to panic if there are a few bad references. Every successful product has detractors. Use common sense when analyzing those search results. Second, buy the product and find out firsthand whether it is a good product or not. Occasionally, you can get a free copy to review, but this is more difficult when you are just beginning. Regardless, even if the product producer has a great reputation don’t promote a product you haven’t seen. 2. Try to avoid promoting the “newest” products. Affiliate marketers have a strong tendency to get excited about and promote the newest “shiny object” products. Often they feel there might be too much competition promoting the more seasoned successful products. Don’t let a product’s popularity scare you. Usually a product is successful over a long period of time because it is a quality product. There are many of these on Clickbank. If you can find a membership that you can benefit from, there are three great benefits to promoting it. First, you add a great deal of weight to your recommendation when you are promoting a product you use regularly. You can provide more detailed insights to your potential customers. Second, ongoing membership products tend to provide a higher quality of current information to your customers. No need to promote the latest fly by night new product if your regular product already includes that information. Third, and most important, and ongoing membership provides you with consistent monthly income without having to create a new customer each month for that income. Clickbank merchants are usually very good at providing free giveaway reports and training to help you sell their products. However, if you send the web traffic you develop straight to those offers you are missing a great opportunity. You are working to develop someone else’s marketing business. Don’t do that. Most people don’t purchase information products the first time they are exposed to them. This applies even to great quality products. Learn to create your own landing pages so that you can collect email addresses to build your own business. You can use this list to increase your chances of making a current sale and also to make sales well into the future once you have an interested ready market to promote new products to. New affiliate marketers often make assumptions about their potential customers that are based only on their own experiences and outlook. This is a huge mistake. Every affiliate marketer needs to experiment with new methods of generating potential customers and new sources of website traffic. From the first day, you should track every source of traffic so that you can test and measure, and then improve, your results. Doing this can make a huge difference in your profits. Clickbank has lasted for so many years for a good reason. It can be a great way to make a nice living as an affiliate marketer. Next: Have you chosen the Right Payment Gateway?